Innovation and R&D Directors Club (iR&Dclub) is a professional community of top-managers from large Russian corporations, who are responsible for innovation development, technology policy, and research and development. It is a special place for sharing experience and best practices, establishing the peer relations, formulation and advocacy of professional interests in the sphere of management innovations and R&D. 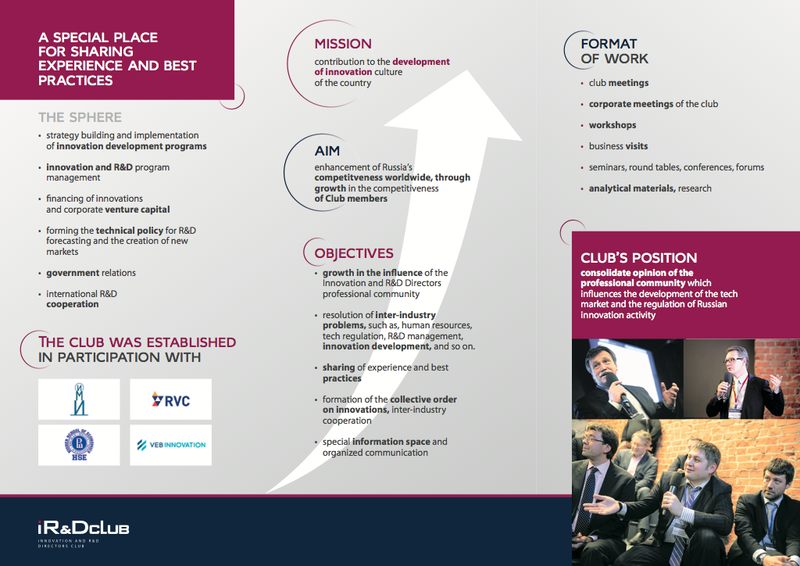 There are over 100 R&D directors from major Russian companies who participate in the Club’s events (e.g. Rustelecom, RusHydro, Power Machines, Aeroflot, Oboronprom, Rostech and others). All information is on our website: www.irdclub.ru.